After swimming, my second favorite weekend activity is to peruse design magazines (perfect weekend: design magazines pool-side), this weekend I curled up with my fave: Elle Decoration UK. Apparently the Brits like to swim too and they chose to rub it in my face by delivering pictures of some of the swankiest pools I've ever ever seen. Here are some of my top pics from the issue. 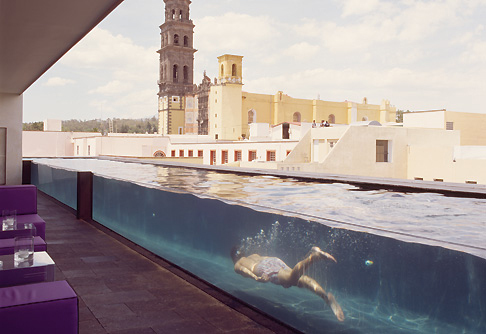 I am so so curious to see what this pool looks like in real life. 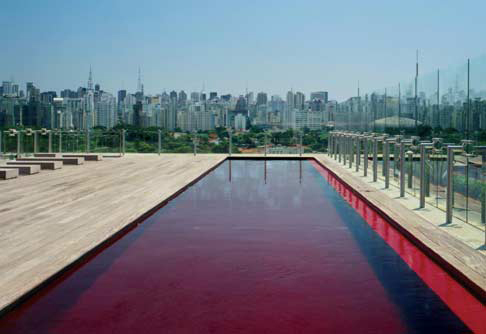 Of course I'm only budgeted to stay in Brazil's swanky Cidade de Deus, but, perhaps I could hop the fancy glass fence. I love how clear the water is in the first picture, I know, it's a pool, it's supposed to be clear. But I really really like clear water so whatever. Those Alps in the background aren't too bad either. I'm not sure what's happening in the last picture but I am willing to guess that it is very calming and relaxing. I know it's kinda hard to tell what's going on in this picture, but I'm pretty sure it's amazing and magical. 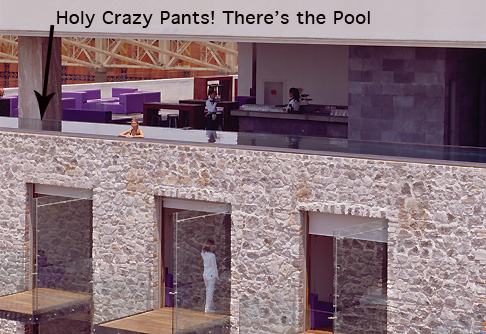 First of all, there's an infinity pool. 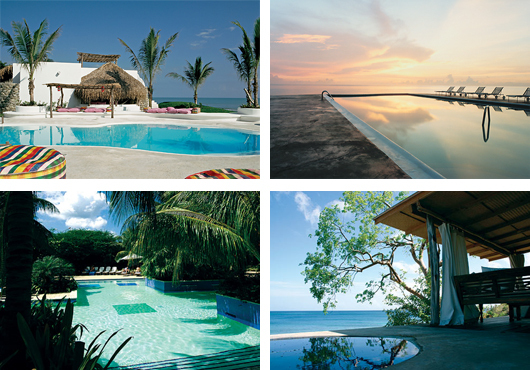 There is nothing on earth better than an infinity pool. Yes, I am so easily amused that if some silly architect tries to trick me into thinking that the water goes on forever, I feel as though I'm living in a giant posh paradise. 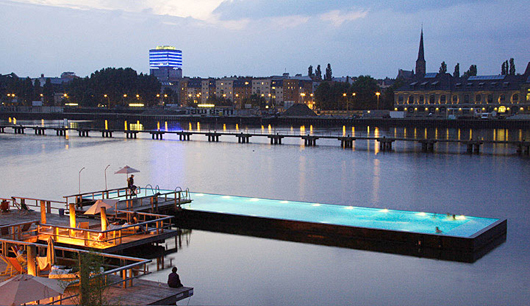 Also, again we see a pool near a real body of water: nature without all the yucky nature encounters: perfect! Don't you just adore the striped ottomans at the Azucar Pool? I think I could make myself feel right at home laying on those bad boys. Also, since these last 4 are in Mexico and the Caribbean they all feel a bit more attainable. Well, at least I like to trick myself into thinking that. I can't help but wonder, if I take back this 3-day weekend I just granted us all, and actually did something a bit more productive, would I be able to afford to visit one of these private alcoves of paradise rather than just fantasize and tell you about it? 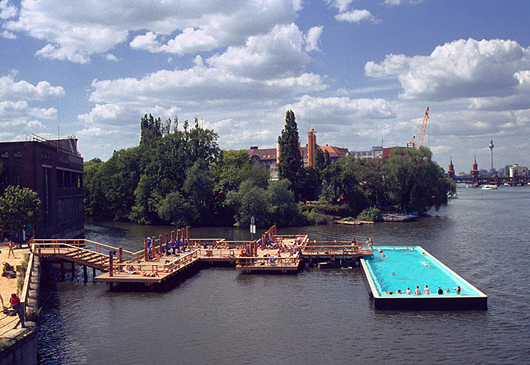 Perhaps we could all go and have the world's most well-designed pool party? Who wants to set up the evite?